Is Drinking From Water Bottles Safe? Drinking water is a mandatory requirement for any human to exist. In the 21st century, a major means of consuming drinking water is through water bottles. Drinking water is a mandatory requirement for any human to exist. In the 21st century, a major means of consuming drinking water is through water bottles. Some of the major conventional types of bottles used are made of plastic, metal, or glass. But can this recent consumption of bottled water through various drink containers be considered safe? Glass water bottles can be said to have no safety issues with respect to storing and using drinking water in it. This could be attributed to the fact that glass is the only conventional packaging material that has been given a "generally recognized as safe" (GRAS) rating by the Food and Drug Administration (FDA). Glass also has the added benefit of being almost completely recyclable. Despite these advantages, glass is a material that can be easily broken, if not handled properly. Metal water bottles are also commonly used due to the unbreakable nature of metal. Metal bottles are either manufactured using aluminium or steel. Aluminium bottles have been found to have lesser instances of chemicals leaching into the water stored. Steel bottles appear to have a higher risk of leaching of chemicals, especially when the liquids being stored are hot, cold, or are acidic in nature. This tends to give the aluminium bottle the edge in safety over steel bottle, with respect to storing water. Plastic water bottles have higher risks associated with storing drinking water compared to metallic or glass water bottles. These are due to factors such as the materials involved in the manufacture of a plastic bottle, the relatively higher reactive nature of plastic with hot or cool liquids, and the possibility of the presence of Bisphenol A (BPA). An important point to note is that the mere existence of particles in water does not mean it is totally unsafe. Water will always have some traces of minerals, like magnesium for example, but they are of such negligible quantity that they do not immediately cause any harm. But on the other hand, continued usage of water that may contain trace elements could have a higher possibility of diseases or serious infections. So with regards to plastic bottles, it is better to check their manufacturing date, their rate of reaction with hot/cool/acidic liquids, and their durability. It might also be a good idea to regularly replace plastic water bottles with new ones to avoid the build-up of trace elemental contaminants from older bottles. The same practice could also be adopted for metal bottles; however, one should avoid storing hot or acidic liquids in metal bottles, unless they have been specifically designed for it. 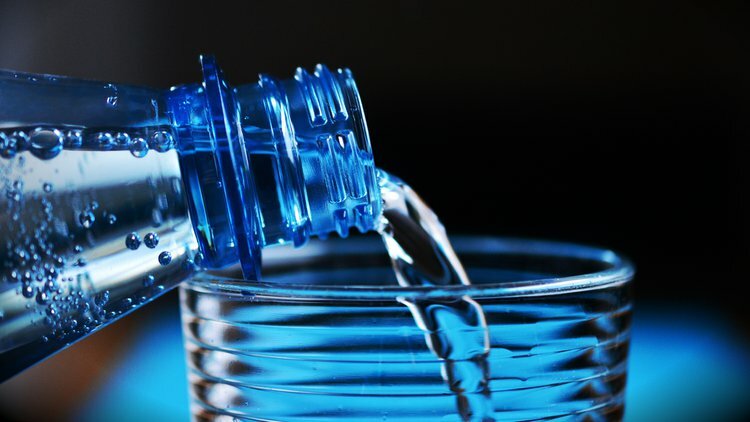 Overall, the relatively high safety material to drink water from a bottle is glass, with the only minor drawback of it being a breakable material. Krachler, M., & Shotyk, W. (2009). Trace and ultratrace metals in bottled waters: survey of sources worldwide and comparison with refillable metal bottles. Science of the Total Environment, 407(3), 1089-1096. Doria, M. F. (2006). Bottled water versus tap water: understanding consumers' preferences. Journal of water and health, 4(2), 271-276. Rosenberg, F. A. (2003). The microbiology of bottled water. Clinical Microbiology Newsletter, 25(6), 41-44. Gleick, P. H., & Cooley, H. S. (2009). Energy implications of bottled water. Environmental Research Letters, 4(1), 014009. Lalumandier, J. A., & Ayers, L. W. (2000). Fluoride and bacterial content of bottled water vs tap water. Archives of family medicine, 9(3), 246. Reimann, C., & Birke, M. (2010). Geochemistry of European bottled water.